You might have heard of the Apple Peel, or perhaps the ZTE Peel Ipod accessory offered by the US Telco, Sprint that allows the Ipod to make calls by tapping into their 3G network. In my opinion, the Apple Peel that was invented by a pair of Chinese brothers is a superior and comprehensive solution because it takes this one step further. Basically, it is an Ipod case with a simcard slot that allows the Ipod to makes calls and text messages. It requires the installation of an app for phone calls and a text-messaging app, onto a Jailbroken Ipod. (Note: Jailbreaking voids all Apple warranties!) If you read mandarin, their website is over here. The 1st gen Apple Peel had some major drawbacks because it does not support data transfer over 3G nor does it fit well on the Ipod Touch 4G. 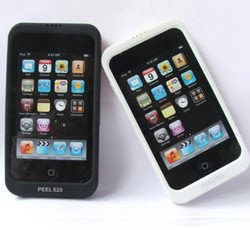 However, according to their website, this capability and the latest 4G Ipod Touch models will be supported by their 2nd gen Peel that is due for a launch date of 20th January 2011. There are various online stores such as this one that claim to be able to ship Apple Peels worldwide with a retail price of US$89. I haven’t tried any of them but they are useful at least for being able to explain in English (with pictures) how the Apple Peel works. If you happen to be in Shanghai and Hong Kong, I’m told that it is easily available at any of the major electronics bazaars.